Birds have three fingers on their hands. So do maniraptoran dinosaurs. Numerous similarities of the hands and wrists of these two groups have been pointed out and included in cladograms over the years. The count and proportions of the individual finger bones are remarkably similar, for instance. But are these characters actual synapomorphies and should they be treated as such in the data matrix of a cladogram? For quite a while now, paleontologists have been pretty confident as to which three fingers remained on the maniraptoran hand from their five-fingered archosaurian ancestors. It seems to show up clearly in the fossil record. Herrerasaurus, an early theropod, has five fingers, but digit IV is greatly reduced and digit V is barely there. Coelophysis seems to represent the next step along the way to a tridactyl hand. Digit IV is reduced and V is gone. By the time Allosaurus comes along, only I, II and III remaing. At least this has been the view of the vast majority of paleontologists who have studied these guys for a long, long time. What about birds? Up until a few years ago, there was no direct evidence as to which three fingers are present on a highly derived bird wing. Archaeopteryx is the earliest beastie that everybody seems to agree is a bird. Archaeopteryx has three fingers on its hands. There is no evidence trail in the fossil record suggesting bird digit identities. Unless, of course, birds are descended from three-fingered dinosaurs. As long as there was no direct evidence to the contrary, it didn't seem out of line for cladograms to reflect bird hands as having the same digits (I, II, III) as maniraptoran hands. 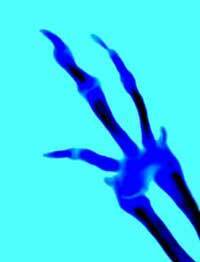 Beyond that, they found a way to photograph the hand at an even earlier stage of development - a five-fingered stage. Others have followed and there is now direct photographic evidence showing embryonic bird hands beginning with all five fingers - II, III and IV are prominent, I and V are reduced. As the hand develops, first digit I disappears followed by digit V.
There have been efforts, recently, to find direct evidence of digit identity in the embryos of birds. In 1997, Burke and Feduccia reported that they found that in developing tetrapod hands the digit that lines up with the ulna is IV. This is an important developmental axis. When they checked bird embryos, the digit that developed like other tetrapods' digit IV turned out to be the one on the outside on an adult bird's hand, suggesting birds have digits II, III and IV. This study did not find five-fingered hands in bird embryos, so it was probably legitimate to wonder, at this point, whether a hand without digit IV might develop with digit III occupying the spot normally occupied by digit IV. In 2002, Larsson and Wagner presented the results of their research that sought to pin this down. 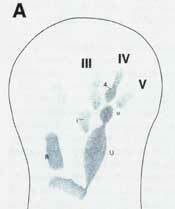 They used molecular markers to further identify digit IV in the developing bird hand. This work confirmed the results of the alignment found by Burke and Feduccia. Hand of hoatzin embryo, above, and adult, below, from Heilmann (1927) reproduced in Feduccia (1996). These folks have pointed out that the genetic and chemical signals that cause the digits to form are distinct from the genetic and chemical signals that cause each digit to develop in a particular way. Smith proposes that sometime after the stage represented by Herrerasaurus, theropods lost digit I. The mechanisms that cause the digits to form the way they do shifted over one place so that digits II, III, IV and V end up looking like digits I, II, III and IV. In this scenario, we actually see in Coelophysis digits II, III and IV remaining prominent while digit V is going away. Maniraptors and birds have digits II, III and IV and all of the synapomorphies in the data matrices of the cladograms are preserved! But until such time as someone comes up with some way to test this idea, it is purely Ad Hoc. 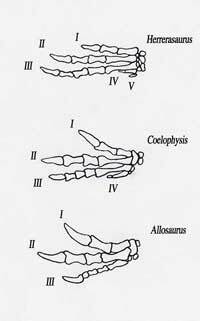 As it stands now, the best independent evidence is that maniraptors and birds have different digits on their hands. But the data matrices of cladograms do not reflect that, because the results of previous cladistic analyses support birds being maniraptors. So the data going into the analysis is modified according to the results of the analysis. That is circular reasoning and bad science. Cladists' claims of objectivity ring hollow. Birds have digits II, III and IV on their hands. At this point, this is undeniable. So do we see the designation of bird digits changing to reflect this new research? And do we see cladograms showing bird and maniraptors with all sorts of characters in the wrist and hand which distinguish rather than unite the two groups? Not quite. And it's getting a little weird. In 1999, Wagner and Gauthier proposed the Frame Shift Hypothesis. Nathan Smith modified and greatly elaborated on this idea in a paper presented at the October, 2003 meeting of the Society of Vertebrate Paleontology.